Circuit Cubes are electronic building blocks that work with any existing Lego set to add movement, sound and light to your builds. NEW YORK — Anyone who's wished their Legos would come to life can make their dream come true with Circuit Cubes from Tenka Labs. The electronic building blocks work with any existing Lego set to add movement, sound and light to your builds. Circuit Cubes come in three different kits, each of which costs $59.95 and comes with the same three cubes: a motor, a battery and a light. The kits' differences lie in their accessories. 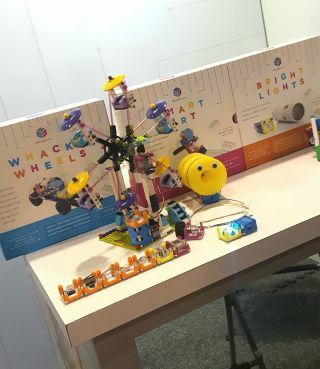 The Whacky Wheels kit comes with a set of wheels and templates to make an underwater rover, a space rover, a parade float and a monster truck — though you can, of course, use the kit to add wheels to any creation your imagination dreams up. The same goes for the Bright Lights kit, which includes a telescope tube, rubber bands and five clear Mylar disks; as well as the Smart Art kit, which comes with markers and patterns to make, including a carousel, a jewelry box, a mobile, a light-up sign and what the kit calls a "Flying Lady." Circuit Cubes caught Space.com's eye at Toy Fair this year because they were used to add motion to an AT-AT Walker from "Star Wars." Because the cubes can be used with any Lego bricks, it's easy to make your "Star Wars," "Star Trek" or other cosmic-adventure Lego sets come to life. Add a motor to an AT-AT Walker as they did at Toy Fair, or build your own lightsaber with the Bright Lights kit — the possibilities are endless. Each kit comes with three cubes: an LED light, a motor and a battery. Although we see the potential for plenty of adults to have fun while coming up with ways to incorporate Circuit Cubes into their Lego sets, the toy is technically meant for children. Tenka Labs co-founders Nate MacDonald and John Schuster were both teachers, and they created Circuit Cubes because they wanted a better way to teach their students about circuits and how they work. They built the cubes with a transparent design so that the kids using them could look inside and see exactly what happens when they flip a switch or power a motor. Circuit Cubes can be used to make any Lego set come to life, like this "Star Wars" AT-AT Walker. Each kit comes with wires that have easy-to-connect clips so you can link the three cubes into a circuit. All of the cubes also have metal poles (one for positive charge and one for negative charge), so they can be stacked on top of one another to create a circuit that way as well. Tenka Labs recommends Circuit Cubes for ages 8 and up. All three kits can be bought from Tenka Labs online or in stores like Target and Barnes & Noble.